The legend of the exquisitely beautiful Shakuntala and the mighty king Dushyant is a thrilling love story from the great Indian epic Mahabharata, which the great ancient poet Kalidasa retold in his immortal play Abhijnanashakuntalam (The Recognition of Sakuntala). Shakuntala means "raised by birds" and refers to her solitary childhood in the forest. King Dushyanta first encountered Shakuntala while travelling through the forest with his army. 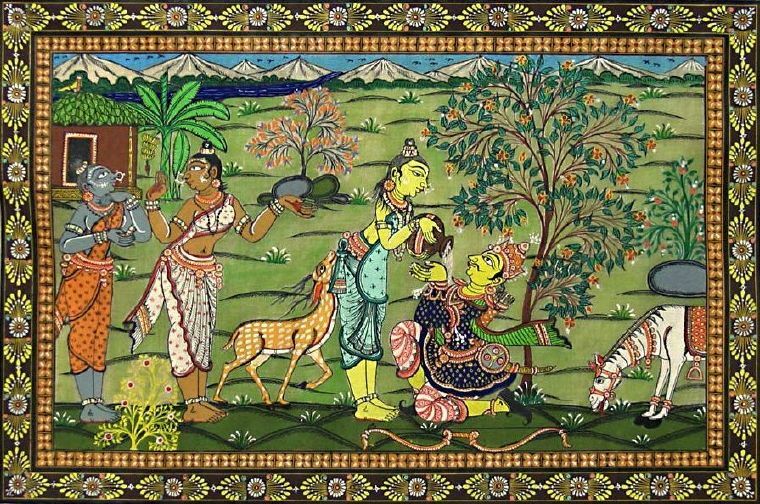 Pursuing a male deer wounded by his arrow into the ashram (hermitage), he saw Shakuntala nursing the deer, her pet, and fell in love with her. He profusely begged her forgiveness for harming the deer and spent some time at the ashram. They fell in love and Dushyanta married Shakuntala there in the ashram, in a ceremony of 'Ghandharva', a form of marriage by mutual consent with mother Nature as the witness. Having to leave after some time due to unrest in the capital city, Dushyanta gave Shakuntala a royal signet ring as a sign of their love, promising her that he would return for her. One day when the hotheaded hermit Durvasa stops at her hut for hospitality, Shakuntala, lost in her love thoughts, fails to hear the guest's calls. The temperamental sage turns back and curses her: "He whose thoughts have engrossed you would not remember you anymore." On the plea of her companions, the enraged sage relents and adds a condition to his curse-statement: "He will only recall you upon seeing the signet ring"
Time passed, and Shakuntala, wondering why Dushyanta did not return for her, finally set out for the capital city with some of her companions. On the way, they had to cross a river by a canoe and, seduced by the deep blue waters of the river, Shakuntala ran her fingers through the water. Her ring slipped off her finger without her realizing it. Arriving at Dushyant's court, Shakuntala was hurt and surprised when her husband did not recognize her, nor remember anything about her. She tried to remind him that she was his wife and was carrying his child, but without the ring Dushyant did not recognize her. Humiliated, she returned to the forests and, collecting her son, settled in a wild part of the forest by herself. Here she spent her days while Bharat, her son, grew older. Surrounded only by wild animals, Bharat grew to be a strong youth and made a sport of opening the mouths of tigers and lions and counting their teeth. Meanwhile, a fisherman was surprised to find a royal ring in the belly of a fish he had caught. Recognizing the royal seal, he took the ring to the palace and, upon seeing his ring, Dushyant's memories of his lovely bride came rushing back to him. He immediately set out to find her and, arriving at the ashram in the forest, discovered that she was no longer there. He continued deeper into the forest to find his wife and came upon a surprising scene: a young boy had pried open the mouth of a lion and was busy counting its teeth. The king greeted the boy, amazed by his boldness and strength, and asked his name. He was surprised when the boy answered that he was Bharat, the son of King Dushyant. The boy took him to Shakuntala, and thus the family was happily reunited.